Bus tours available to adult, school and student groups traveling to New York City with Pro Musica Tours. 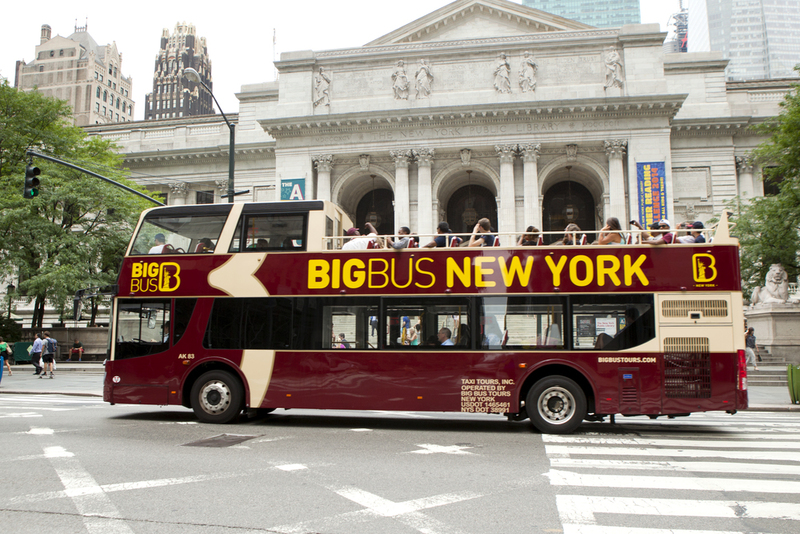 The hustle and bustle of New York City can be experienced through a variety of bus tours. Your personal tour coordinator is happy to recommend specific tours based on the interests and composition of your group. Manhattan Movie and TV Tour: This exciting tour introduces your group to entire city of Manhattan as they explore different locations where famous TV and movie scenes were filmed as well as view many historical New York Landmarks. New stops on the tour include locations from The Devil Wears Prada, The Interpreter, Rescue Me, and The Apprentice. Catch a glimpse of the restaurant used in Spider-Man. Visit the apartment building where Monica, Chandler and the other Friends lived. Go on location to the building where Grace on Will & Grace has her design studio, and sit on the steps of the Cosby townhouse. Go on location to the diner used in Men in Black and Woody Allen's Manhattan. Stop in at one of the locations used in Hitch, and take photos at the firehouse used in Ghostbusters. Most of all, Come ready to sing TV theme songs! Manhattan Highlights Tour: Sit back and relax as our guided tour takes off around The Big Apple. This tour gives you the opportunity to see Columbus Circle, Lincoln Center, the Cathedral of Saint John The Divine, Central Park, Fifth Avenue, and Rockefeller Center. Discover the best of midtown with Times Square and the Chrysler Building, head downtown to the Village, see artsy SoHo, the bustling streets of Chinatown, Little Italy's sidewalk cafes and the busy Wall Street area. From Battery Park, enjoy the view of Lady Liberty in all of her majesty. Manhattan Night Lights Tour: Take a bite out of the exciting downtown nightlife. Catch a glimpse of the hottest nightspots and stroll through the newest bohemian neighborhoods. From Brooklyn Heights to the top of the Empire State building, you will be treated to breathtaking views of New York, "the city that never sleeps," with its illuminated landmarks, colossal bridges, and busy harbor. Harlem Gospel Tours: Join us on a Sunday morning in the African American capital of the world. Learn all about Harlem, from it’s start as a rural Dutch community, through it’s transformation into a summer retreat for New York’s most prominent families, how it then became a Mecca for African American writers and artists at the turn of the century, to it’s troubled past during the 1960’s and 1970’s and it’s present day community brimming with pride and reveling in it’s new renaissance. Along the way you will see famous sights and landmarks such as the Cathedral of St. John the Divine, Columbia University, City College, Morning Side Heights, the Morris Jumel Mansion, Sylvan Terrace, Strivers Row and The Abyssinian Baptist Church, Sugar Hill, St. Nicholas Avenue, where Duke Ellington lived, and the famed 125th street, Harlem USA, the Cotton Club, and the Apollo Theater, the Schomburg Center for research in Black Culture. Then, join a local congregation for the Sunday worship service and experience the soul stirring power of Gospel music. Your group will have the option of including a delicious soul food brunch following this exciting tour. Harlem Soul Food and Jazz Tour: Relive the Harlem of the 1920's: At sundown, tour this neighborhood’s contrasting areas down in the "Valley" and high on the "Hill." Witness the return of Jazz uptown, learn the history of this center of Black culture, the birthplace of bebop, and the home of the Harlem Renaissance. Indulge your palate with a traditional homestyle southern soul food meal at a local restaurant, and for groups where all tour members are 21 years of age and older, enjoy a jam session at a local Jazz club, where the drinks are on us and the music is steaming. The Ride: The Ride is the critically acclaimed attraction that uses New York City and its iconic landmarks as the backdrop for a theatrical event that blurs the boundary between tour and performance. The Ride's patented traveling theatre-busses are designed with coliseum seating and floor-to-ceiling glass windows truly making the streets the stage. Enjoy The Ride's hilarious hosts as you take in pop-up performances along the 4.2-mile route through Midtown and Times Square by The Ride’s talented ensemble of actors, singers, dancers, and instrumentalists. Discover the Bronx: Want to get off the beaten path and see more of New York than just Manhattan? Let us show you the Bronx as it really is, a borough of diverse ethnic groups and neighborhoods, of great cultural institutions, and surprising natural beauty, See Yankee Stadium, the Bronx Zoo and the Botanical Gardens, Mott Haven Historic District, and the Art Deco architecture of the Grand Concourse. Stop at Arthur Avenue, the Bronx's Little Italy to enjoy a cappucino. See Fordham University, the largest Jesuit University in America. Drive by Yankee Stadium, home of the legendary New York Yankees. Discover the hilly, secluded enclaves of Fieldston and Riverdale overlooking The Hudson River.